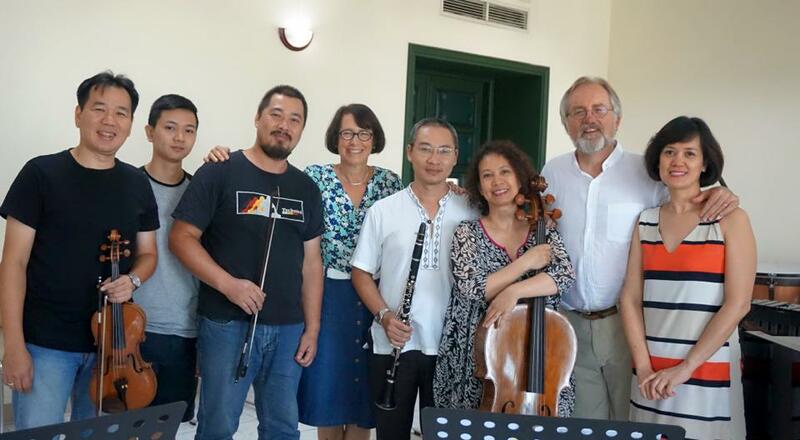 A happy reunion for Stravinsky’s early Pastorale with soloist Phan Thị To Trinh and friends. 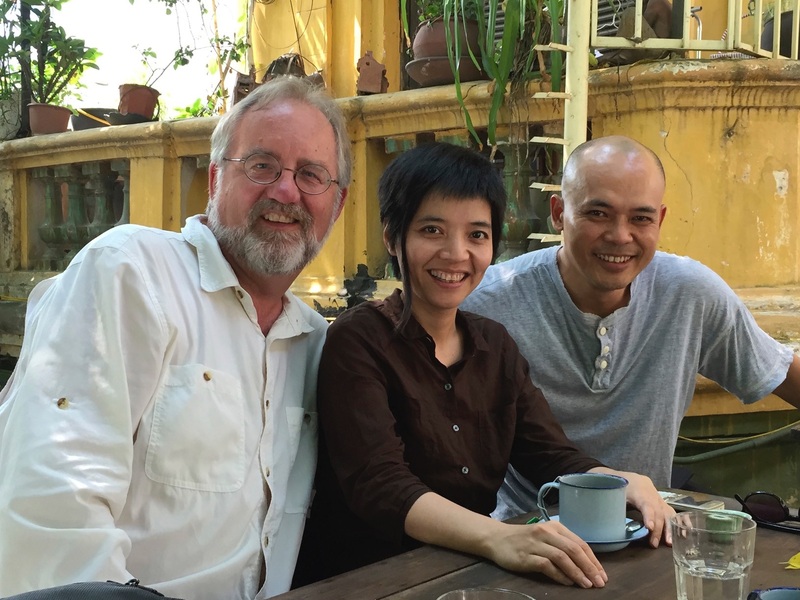 Jan and I have been in residence in Hà Nội since early September and remain in Việt Nam until early November. Mastering septuplets is new around here, performing a piece with multiple simultaneous tempi isn’t normal, and inside the piano technique, Bartók snaps and sul ponticello aren’t taught as part of the vocabulary – at least until now! Pianist Tam Ngọc Trần takes to being inside the piano like a fish to water! So here’s the concert program of the second season opening concert. I’d usually list what is and is not a premiere, but trust me, they are all premieres here! 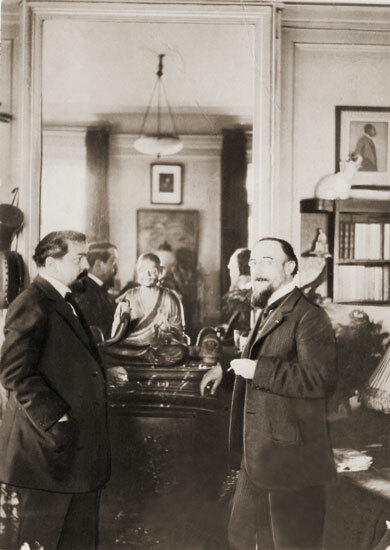 Search my post The Buddha on the Mantle for more on Debussy’s Paris apartment with Erik Satie (photo probably by Igor Stravinsky). I have often said in my blog that the obvious is often quite difficult to grasp. In the case of Western instruments and classical music being part of the cultural life of Việt Nam, the obvious inflection point of repertoire points to a former enemy, France. However history is rarely if ever convenient. There aren’t a lot of Debussy or Ravel retrospectives here. 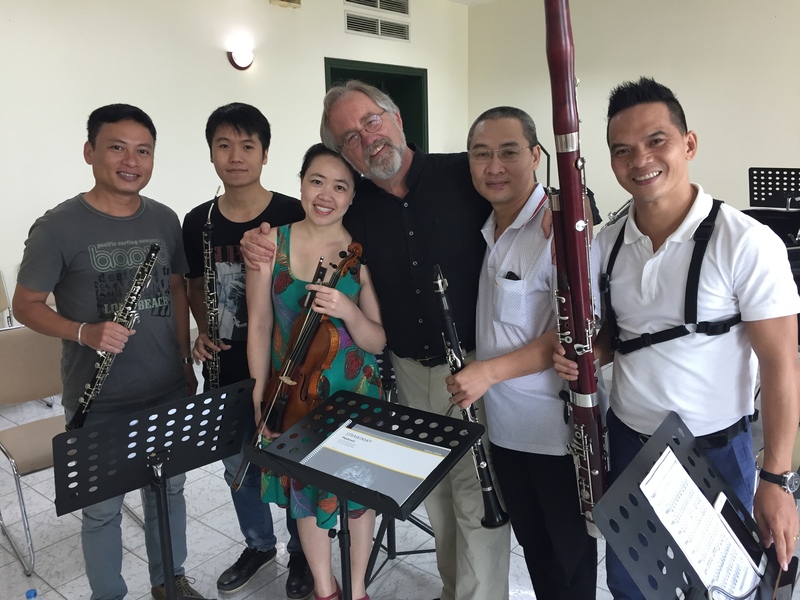 Last year, my work with the Hà Nội New Music Ensemble was that of straightforward inauguration. It was a period of “Let’s just see if we can get the concerts up on stage.” Now my work begins in earnest. 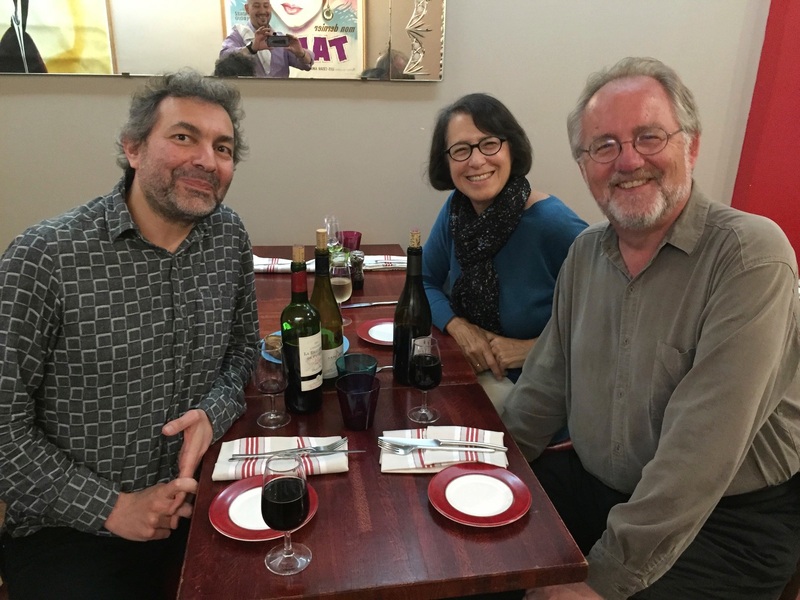 To return to the obvious, in order to mature the repertoire of the musicians, beginning a long term commitment to French music is something this American is happy to motivate. Emmanuel Labrande, the director of the l’Institut français du Việt Nam-Hà Nội mentioned to me that establishing continuity was a next step key to advancing culture in Việt Nam. We agree, as does American Ambassador Ted Osius and his husband Clayton Bond. Meeting this week with Clayton Bond at the Ambassador’s Residence. For new music and Việt Nam, Paris is unavoidable. Both the late Nguyễn Thiên Đạo and the still vibrant Tốn Thất Tiết are French citizens, a fact that is obvious but complicated. 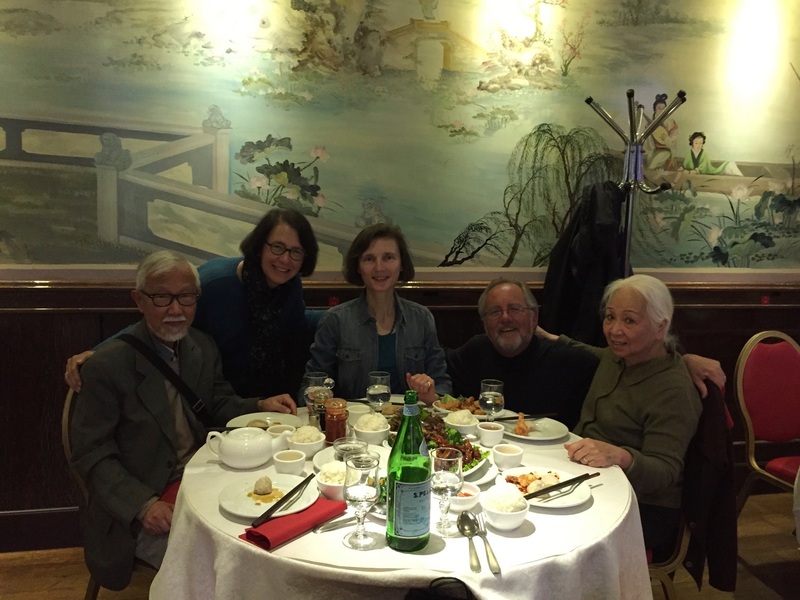 Paris is a city of bridges, so beginning a restoration of genuine continuity between Hà Nội and Paris was a topic that Jan and I actively engaged when we visited numerous friends this spring (search a few past blog posts for more information). 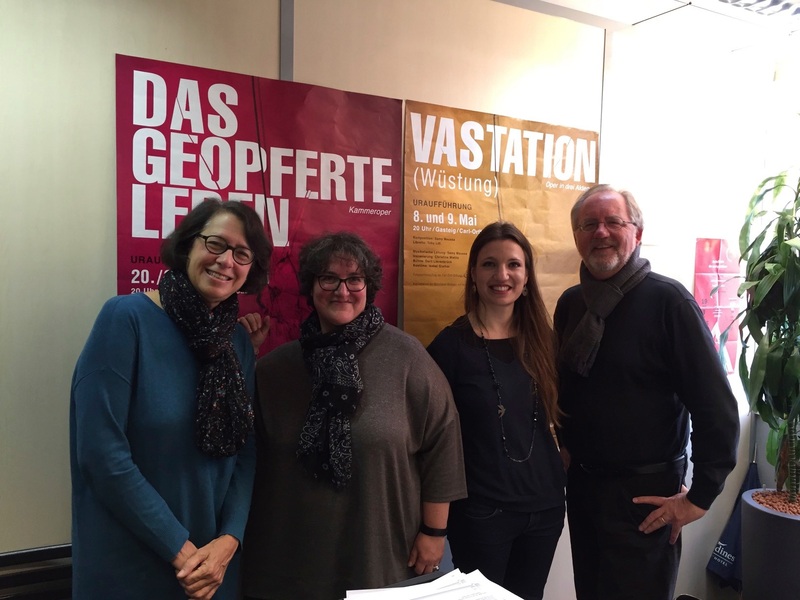 Our long friendship with the family of Arnold Schoenberg still provides us with rich experience about the reality of being an emigre and the long term rupture that situation creates for cultural continuity. With Tốn Thất Tiết, harpist and Tiết biographer Laurence Bancaud and Tiết’s wife, poet Tam Quy. 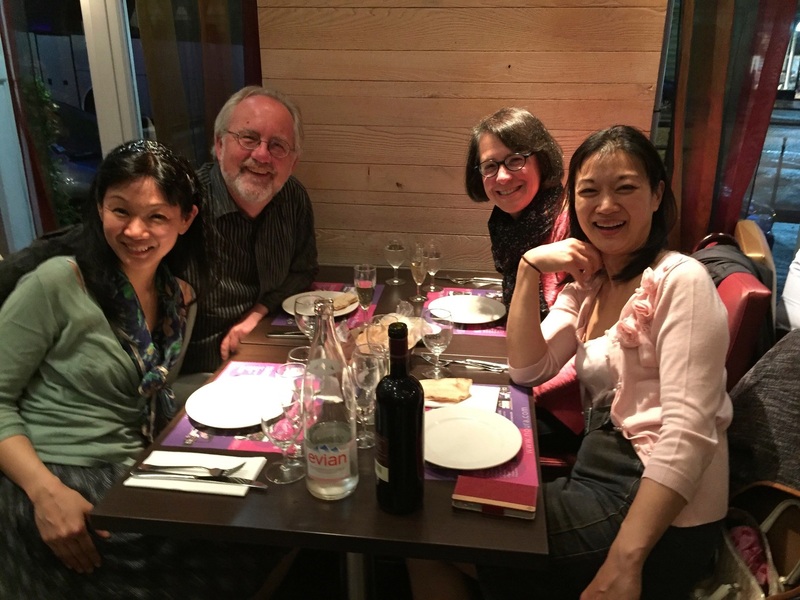 With pianists Momo and Mari Kodama. 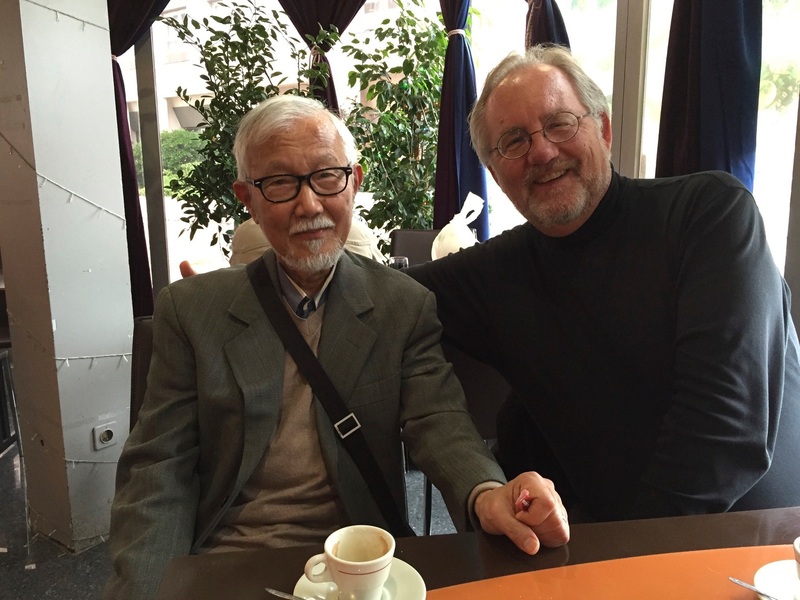 Momo toured Japan in 2013 with Honna Tetsuji and the Việt Nam Symphony Orchestra as the dedicatee of a piano concerto by Nguyễn Thiên Đạo. 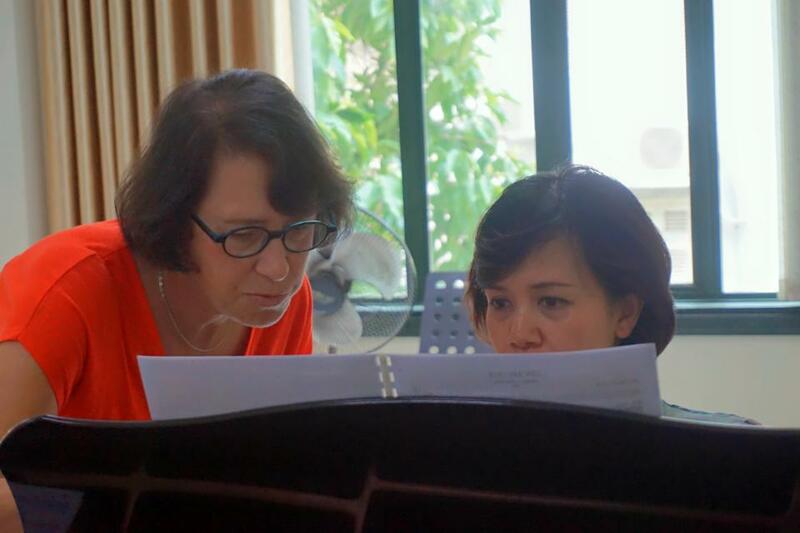 With Patricia Alia and Caroline Maby of Universal Music Group, who published Nguyễn Thiên Đạo. With composer Gilbert Nouno. Gilbert was also a long time sound designer for Pierre Boulez. 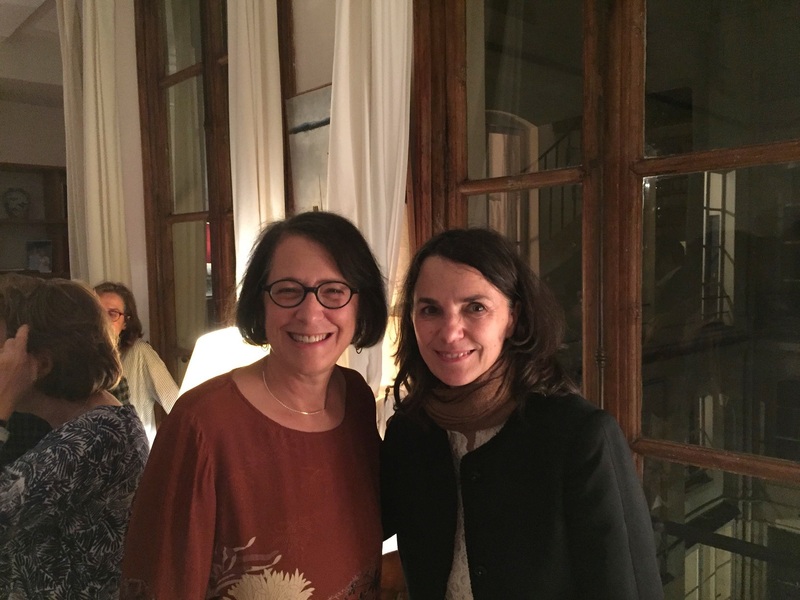 Jan enjoys a wonderful discussion about the Hà Nội New Music Ensemble with arts manager Catherine le Bris at a Paris post-concert party for Momo Kodama. And so by setting the Paris stage for the second season opening concerts of the Hà Nội New Music Ensemble and our hosts, the l’Institut français du Việt Nam-Hà Nội, I’ve turned to a piece of incredible symbolism for my career. Debussy’s Syrinx was the piece that began my ensemble in Los Angeles, Southwest Chamber Music, that now presents the Los Angeles International New Music Festival, a biennial series of concerts held at the REDCAT Theater in Walt Disney Concert Hall. First obvious things first. You have a new music group? Who is your flutist? Problem solved in Hà Nội. Identifying strong musicians needed for the dedication to new music is one of many tasks for my residence here this fall. I could not be happier with flutist Nguyễn Trọng Bằng, who takes to every challenge with enthusiasm. Enjoying a good glass of Vietnamese wine from Dalat, with a hint of mulberry wood (yes, the French planted vineyards). The concert opens with a triptych of works for solo flute, Debussy’s Syrinx, followed by a tombeau for the late Nguyễn Thien Dao, a masterfully evocative work for flute and six gongs from the Việt Nam War era, Tuyến Lửa or Frontlines. 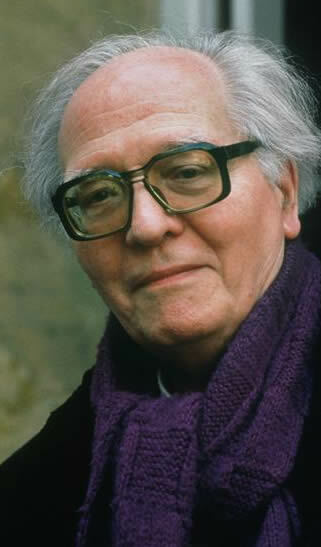 To complete the short triptych of pieces is Le merle noir by Olivier Messiaen, who was Đạo’s beloved teacher, carrying significant impact to the Vietnamese. Messiaen hovers throughout Asia like a gigantic aviary over its new music. His faith was devotedly Catholic, but the sounds, the ideas, the rhythms and the gongs speak of and to the East. 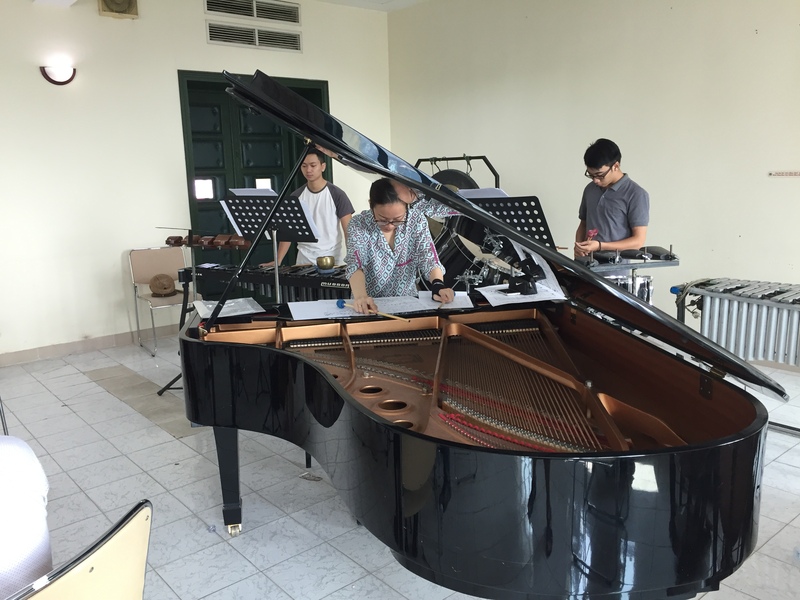 Olivier Messiaen’s Le merle noir is on the opening concert of the Hà Nội New Music Ensemble. All Asia celebrates seasonal changes more than any Western country I’ve ever experienced. Here, acknowledging the shifts in weather borders on obsession, not unlike the Vietnamese penchant for a specific sauce for a specific dish, which inhabits a French-like culinary insanity, delicious but intense. And so when I received a piece for violin and piano by Tốn Thất Tiết called Autumn Winds or Thu Phong in Vietnamese, this wistful garland of floating leaves answered my own obsession to focus on the obvious. 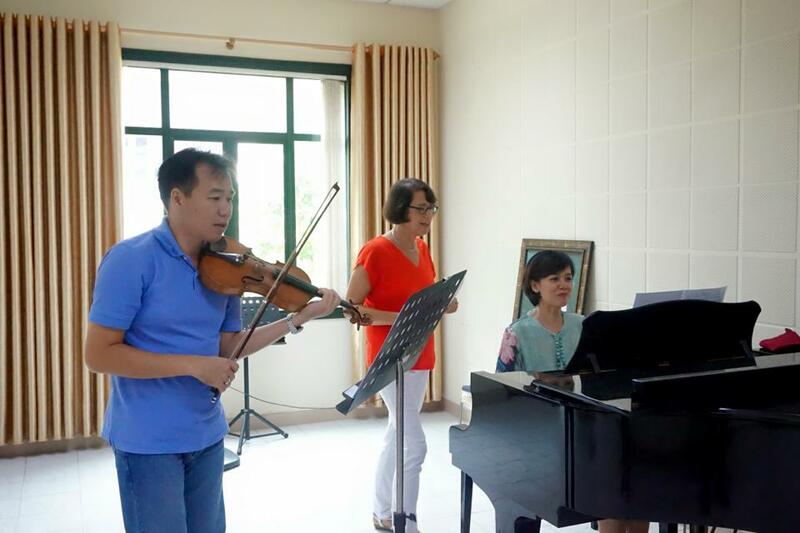 Jan working on every detail with pianist Quỳnh Trang Phạm. Jan with Phạm Trường Sơn and Quỳnh Trang Phạm. Because our mission here is simple. Jan and I are asking the musicians to do something difficult. Our job is to tell them why it is important. Establishing continuity for new Vietnamese music is the goal. Jan and I are the messengers. We are hoping to create new chapters between the United States, France and Việt Nam out of a deeply troubled and tragic 20th century. So be patient, we are just getting started! The face of change as I discuss developments and ideas for the Hà Nội New Music Ensemble with Tiết in Paris. But the back story with Tiết’s music is larger. Last year, I brought a solo cello piece of his, Voyage, which was written for Rohan de Saram, the cellist of the Arditti Quartet. 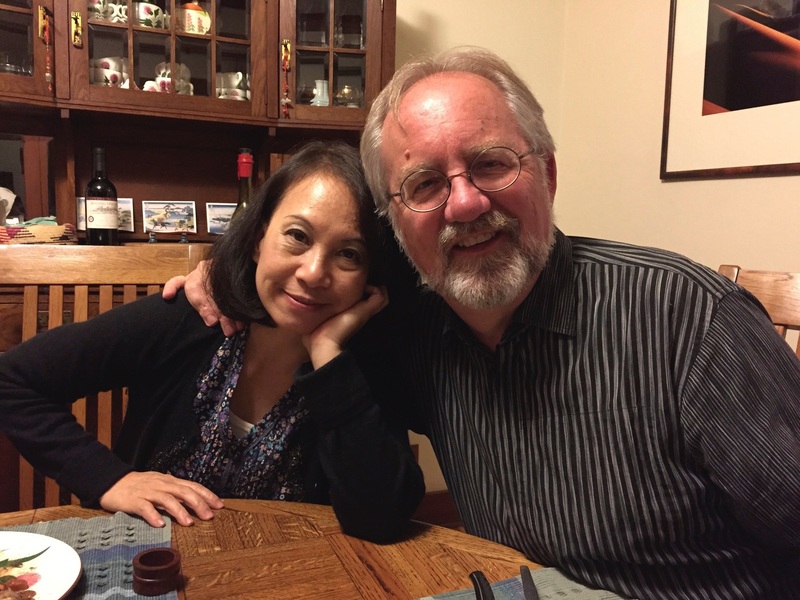 I showed it in my dressing room to cellist Tuyet Trinh Đạo, who I am sure when she first looked at the music thought a Vietnamese version of “Mommy!” But she brought the piece to our Pasadena home in December of 2015 for a 90 minute lesson with Jan. One step at a time. Now, she hears the blending of India and Việt Nam with echoes of songs from Huế, Tiết’s hometown, something Jan and I learned from her. 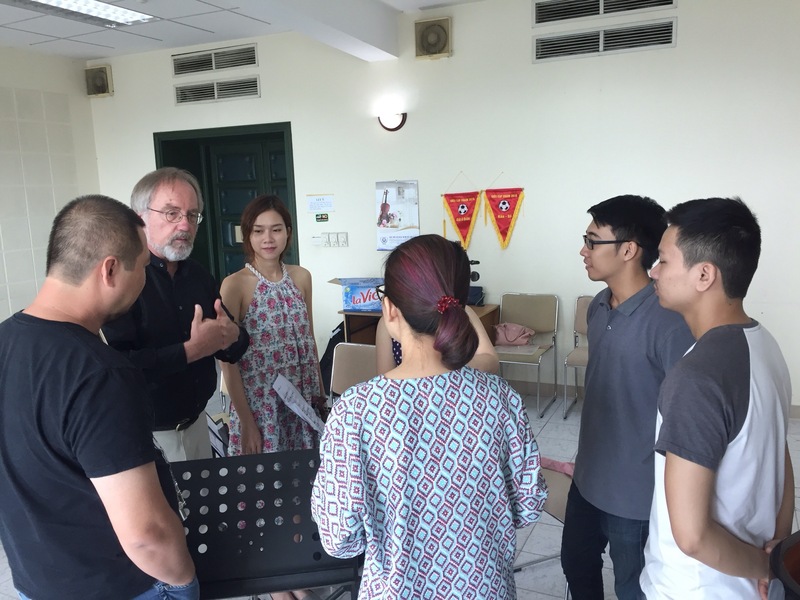 After all, new music groups need great players, pure and simple, so part of the obvious equation is to get the Hà Nội musicians into true challenges that will improve their musicianship. 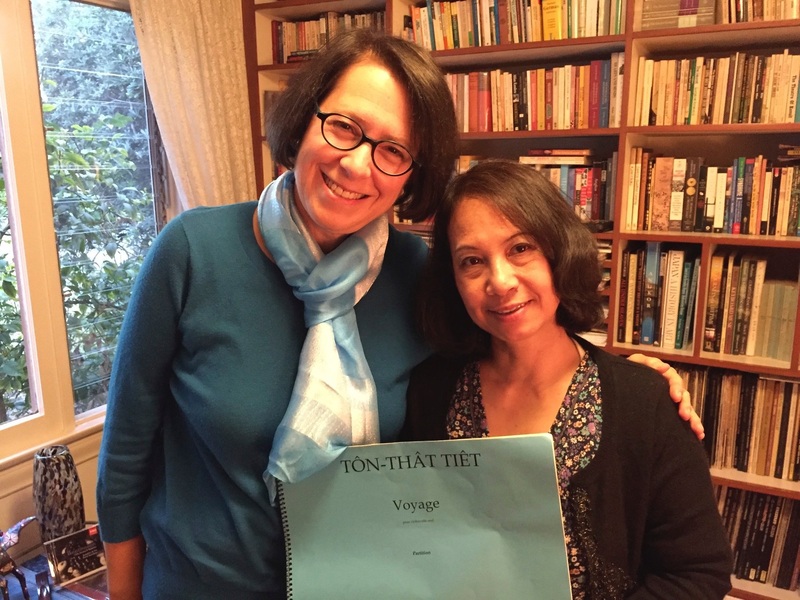 Jan and Trinh in our Pasadena home working on Tiết’s Voyage. Another part of continuity is your teacher. Esa-Pekka Salonen was right when he said after Pierre Boulez passed away this January that while he was alive, you could complain about Boulez’s stance on this or that. But now that he’s gone, you can’t. The accomplishment of his life dedicated to music is astonishing and part of our endowment as musicians and cultural citizens. And both Nguyễn Thiên Đạo and Pierre Boulez studied with Olivier Messiaen. 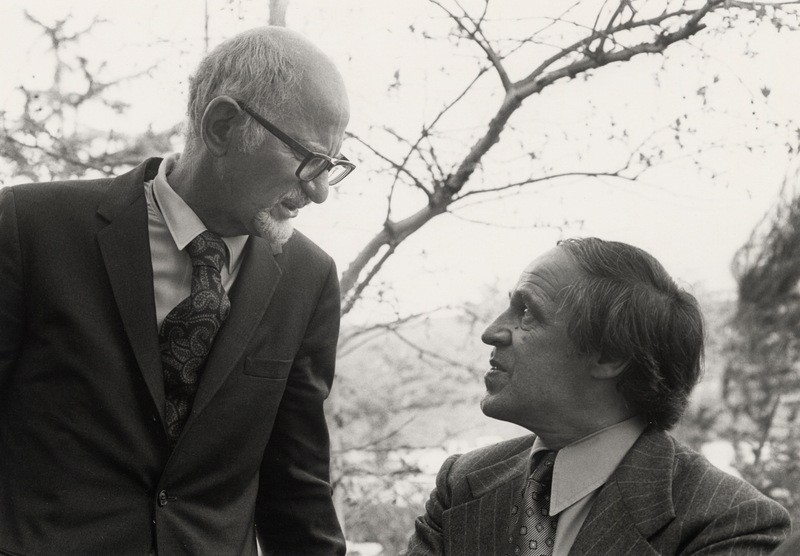 Pierre Boulez with his teacher, Olivier Messiaen. And one of my teachers was Leonard Stein, who was the legendary Los Angeles assistant of Arnold Schoenberg, whose family to this day Jan and I count as some of our best friends on Planet Earth, still finding time for birthday parties and visits (we’re overdue since I’ve been out of town a lot this year). Leonard Stein and Pierre Boulez at the opening of the Schoenberg Institute at USC. Boulez’s last piece, Dérive 2 (for 11 instruments) is dedicated to our musical grandfather, Elliott Carter (search one of my most popular posts for more information). Jan with Elliott Carter at 101 in his Greenwich Village apartment, January 2010. Jan and I both feel that our meetings with Carter over the years were the most formative of our career, not only for the generosity of his personality but the depth of his ideas and inspiration of his music. Turning 61 this summer, I am beginning to contemplate my own next steps as these personal influences now loom as musicians standing the test of time. But Dérive 2 is not a good choice, yet, for Hà Nội. As was usual with Boulez, he took an idea and later expanded the original. So his final piece for Elliott Carter was preceded by a near perfect ensemble étude, Dérive 1 dedicated to Sir William Glock, who hired him to lead the BBC Symphony in London. 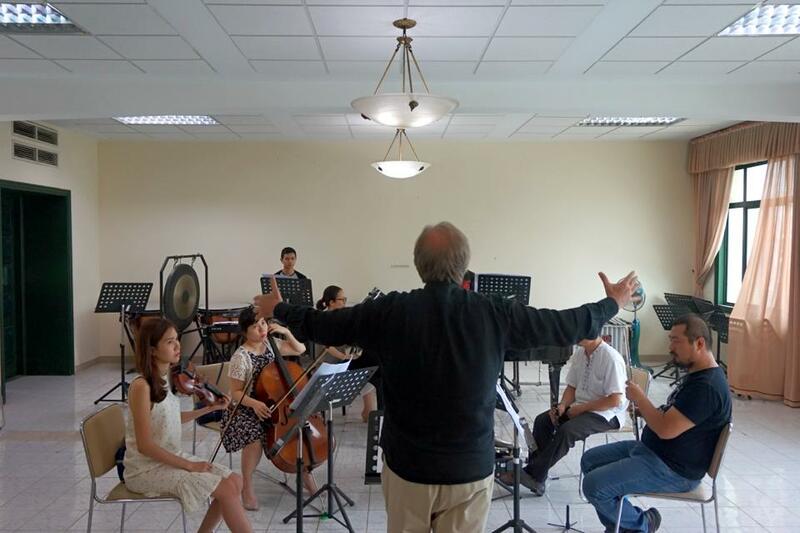 In email exchanges about my work here in Hà Nội with my friend conductor Kent Nagano, he remarked that my Vietnamese players should understand well the pastel colors needed for Boulez! After a successful first reading of Dérive 1 by Boulez. 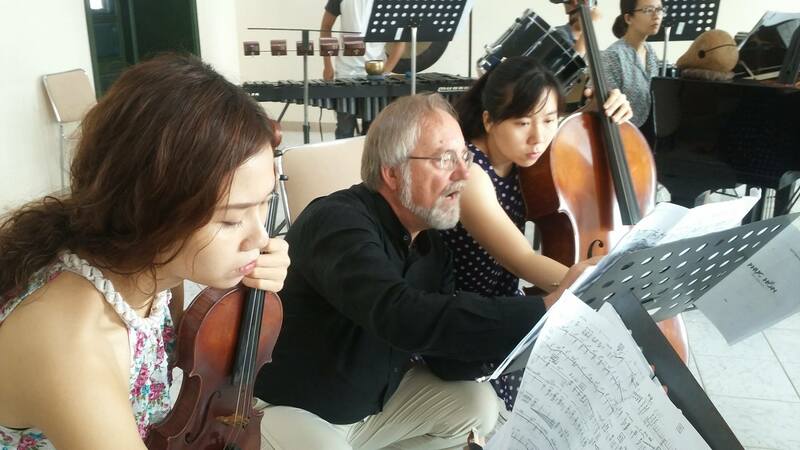 After intermission, we’re happy to program a piece by Didier Latroupe, a French composer living permanently in Hà Nội with his Vietnamese wife Đường Thị Thủy and their daughter, Josephine. His solo flute work, Stèle, is a beautiful composition of moving poetry, reminding me of Mallarmé, coming out of his tradition from France, a tradition begun by Claude Debussy and a perfect vehicle for Nguyễn Trọng Bằng. 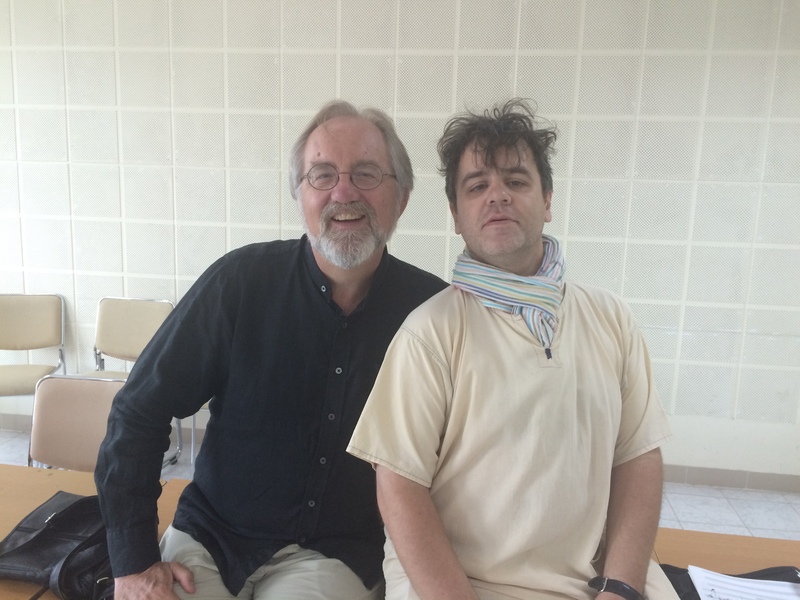 With composer Didier Latroupe and his intentional scarf à la Henri Dutilleux! With composers Trần Kim Ngọc and Vũ Nhật Tân at Cộng Cà Phê. 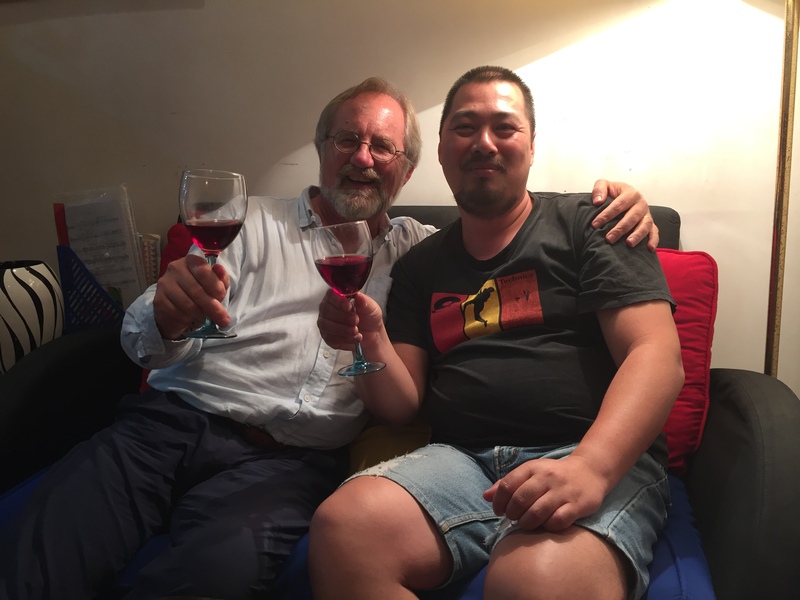 The concert will close with two works by Hà Nội composers Trần Kim Ngọc and Vũ Nhật Tân, both written under the influence and encouragements of Tốn Thất Tiết. My father passed away in 1994. According to Vietnamese custom, on the third day after a loved one’s death, his family holds a ceremony known as PHỤC HỐN. Vietnamese people believe that after spending three days in the supernatural world, dead people’s souls often try to return to their bodies in this world, only to discover that they cannot reintegrate themselves and sadly, cannot return to their previous lives. They are unable to accept their own deaths, and thus their spirits continue to remain close to their relatives, participating invisibly in the daily events of their families. They are extremely frustrated, regretful and full of nostalgia for the memories of former lives. This is the time to perform a PHỤC HỐN ceremony. Buddhist monks, who are intermediaries between this world and the next one, perform a ceremonial rite to console them, and to convince them that they truly no longer belong on earth. They are told to make peace with their deaths, and to be happy as they pass on to an eternal world. I loved my father very much. My mother and I celebrated a simple PHỤC HỐN for him. Afterwards, I wrote this piece in worship for his soul. Ngọc’s music resonates with ancient Vietnamese percussion instruments, number symbolisms of 4 and 9 abound, multiple tempi represent herself and her mother, her father’s spirit and the intermediaries of the Buddhist monks in percussion and piano. A thoroughly powerful composition, and intrinsically Vietnamese. 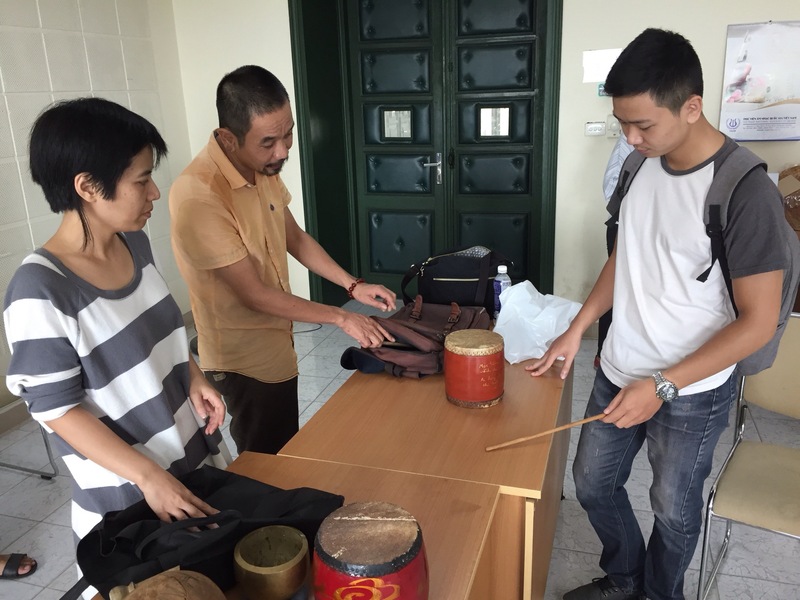 Đàm Quang Minh of the Ancient Music Ensemble of Tonkin demonstrates the right technique to strike a Vietnamese drum to percussionist Lu Cương. Our November concert will collaborate with the Ancient Music Ensemble of Tonkin and I’ll return in another post to discuss this aspect of ancient and new music in Hà Nội. Ngọc’s piece has been played in Germany by Ensemble Modern, but this will be its first performance in Việt Nam with Vietnamese players. And to conclude, we offer Ký Úc or Memory by Vũ Nhật Tân which received its world premiere in, d’accord, Paris. A powerful percussion concertino with passages of dragon drumming exorcism and lush woven tapestries of marimba, vibraphone and piano, this piece should bring the house down. Which it did, mid-concert, when I performed it in Los Angeles in 2010! Rehearsing Ngọc and Tân in their hometown of Hà Nội. Yes, my arms are open rehearsing my friends in their own music. I enjoy telling them that the technical difficulties are all coming from Vietnamese composers! Slowly but assuredly each rehearsal is improving, the basics of finding septuplets, holding to a personal tempo with three other tempi around you, making emotional sense of new music, lunging at piano strings and snapping a Bartók pizzicato, all of these details are coming into focus. I often huddle the players to encourage togetherness in ensemble, to make holding a tempo a family affair. Now that’s something the Vietnamese understand. As I make improvement in their daunting language (when I’m successful in Vietnamese calling out “Bar 99, beat 3” I feel like I’ve earned an honorary doctorate) they are understanding why a difficult task is important. Discussing holding a tempo together like a family.